This is the time of the year that Gunnison Ranchers and Farmers harvest most of their crops. The largest by far is the grass hay grown in the Gunnison Area. Farmers moved into Gunnison and tried several types of crops, but found that the growing season was too short. Potatoes were farmed a little longer than most of crops. My article today will show how the hay crop being harvested has changed. In the mid to late 1800’s the hay was harvested mainly by man power. The rancher would cut the grass in several different ways, all by hand and stacked either in their barn or in larger piles of hay in a central location on the ranch to be fed to the livestock during the winter. The Gunnison hay fields did not always look like they do today. The early ranchers had to pick a lot of rock out of the fields this was done by hand and horse drawn rock sleds. The green meadows you see driving through the Gunnison Valley are all of native grasses, timothy, brome, clover and various types of wheatgrass. The ranchers start flood irrigating their hay fields during the month of May and harvest their hay starting sometime after July 15th and finish before the 1st of October. The process has not changed much over the past 150 years. The way of harvesting the hay crop has change greatly, as I will try to explain on the next page. In the early 1900’s hay was put up by the use of horse power. The hay was mowed with horse drawn sickle type mowers. The museum have two of these type of mowing machines on display. After the grass was mowed it was put in windrows by using Sulky Rakes. We have two of these rakes on display. After the hay is in a windrow a Buck Rake pulled by horses will bunch the hay up and take large loads of hay to the stacker. There is a horse drawn Buck Rake at the museum. We have two Overshot Stackers located on the museum grown. There were several different type of hay stackers used up through the early 1960s’. The Overshot, Beaver-slide and Jenkins. All of these stackers were operated by a horse being hooked to a cable that was hooked to the stacker. The horse would pull the stacker teeth loaded with hay and dump it onto the stack, the horse would be lead up about 40 feet dump the hay and then led back to the stacker, this was done for every load of hay. When automobiles and tractors were invented, machinery took the place of horses. The Allis Chambers, John Deere and Ford were popular tractors used in the Gunnison Valley. The tractor was used for mowing the hay down and pulling several types of machinery in the hay fields. The typical ranch in Gunnison had an Allis Chambers Tractor that could be converted to run backwards and used as a buck rake. A small tractor took the place of the horse that pull the hay on the stacker and dumped it onto the stack. The side delivery rake was developed to put the hay into windrows. Some of the ranchers bought old pickups and converted them run backwards and installing wooden teeth to pick up the hay, (there given name was Doodlebugs) and put it on to the stacker which would dump it onto the stack. The Sulkey Rake started to be used to rake up the hay scatterings that was left by the buck rakes. They became known by the name of scatter rakes. Most of the time there would be two or more men on the stack to move the hay into different areas of the stack. The hay would be stacked into stacks of about 28 to 30 ton of hay per stack. The stacking of loose hay became the thing of the past in the late 1950’s and early 1960’s. The use of balers and making bales of about 100 pounds, they were tide with wire or twine became very popular. 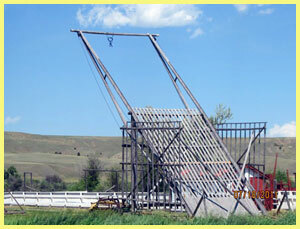 The baller reduced the amount of man power and equipment needed to put the ranchers hay up. 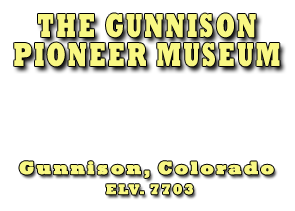 Most of the above equipment mentioned can be seen on the grounds of the Gunnison Pioneer Museum. We are very proud of our display of ranch equipment. Dean and Rose Blackwell, George and Norma Betz Esty Ranch, Odom Ranch, and Gandy. I really enjoyed writing this article. I had the privilege to live the haying stage of the 1950’s. I was able to work for some of the ranchers running most of the equipment. I started out in 1951 and 1952 leading the stacker horse on the Mac and Marge Cooper’s Ranch 5 miles west of town. In 1954 I ran a side delivery rake and scatter rake on Mr. and Mrs. Pete Fields Ranch on Quartz Creek East of Gunnison. In 1955 I started working on the Lee and Polly Spann Ranches. In 1955 and 1956 I mowed hay and ran the side delivery rake, 1957 through 1960 I stacked hay. The Spann ranch is located 3 miles west of Gunnison. It was the greatest experience a boy age 9 to 18 years old could ever have. I know some of these ranchers are not around today, but to them and the ranchers that are still here, I would like say THANK YOU!!! Remember that the museum is open seven days a week from 9:00 A.M. to 5:00 P.M. We would like to have you visit the museum and see all of the treasures that we have on display. We are always accepting new members and volunteers.